Everyone has heard the saying – “it is always darkest before the dawn”, for American performance car fans the period of the mid-1970s to early-1980s was a very dark period. During this time engine displacement shrank faster than the current price of a Federal Reserve note. Horsepower dropped to correspond with the massive displacement drop. 1970-1971 V8 powered performance cars had on the average 300+ horsepower, by the early-1980s performance V8s were at least half that horsepower. Rumors were flying by the early-1980s that even the remaining passenger car V8s (which were all small displacement V8s by this time), would soon bite the dust. There were rumors of a V6 Camaro to replace the V8 powered Z28 and a future Mustang GT with no V8 option. It was very bleak news at the time. Every performance car fan was just waiting for the next shoe to drop and with it the final blow to the performance car. Horsepower dropped generally by 1982 to its low-point. For 1982 the top motor in the (new third generation) 1982 Chevrolet Camaro Z28 and Pontiac Trans Am was the 5.0 liter (305 CID) Cross-Fire Injected V8 rated at 165 horsepower (20 horsepower more than the base 5.0 liter LG4 4bbl V8). This was a drop for the Trans Am which the previous year had a 4.9 (301 CID) turbo V8 that produced a healthly 200 horsepower. The Camaro Z28 also saw a drop from its top 1981 motor – the 5.7 liter (350 CID) LM1 V8 which produced 175 horsepower. However there was a silver lining in this dark cloud, a performance drop was not really seen on the Z28 for 1982 (in fact it was a slight performance bump) due to the 1982 Camaro shedding around 500 lbs vs. the 1981 Camaro. On the Trans Am it was another story the 1982 Cross-Fire Trans Am performed on par with the much heavier 1981 Turbo 301 Trans Am. Meanwhile at GM’s archrival Ford, a newly revived Mustang GT was released for the 1982 model year with its top motor being a 5.0 liter (302 CID) High Output (H.O.) 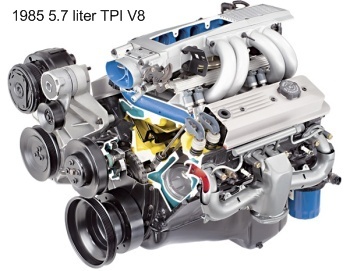 V8 producing 157 horsepower that came equipped with a maditory 4-speed manual transmission. Though the revived Mustang GT had 8 horsepower less than the Cross-Fire Fuel Injected GM F-bodies (Z28 and Trans Am) it accelerated slightly quicker than the pair due to a slightly lower curb weight and the fact that the F-bodies were saddled with a mandatory three-speed automatic transmission. On the 1982 F-bodies you had to go with the 145 horsepower base LG4 5.0 liter V8 to get a manual transmission option. Right around the 1982 Mustang GT’s performance territory was the 1982 Chevrolet Corvette with its 200 horsepower Cross-Fire Injection 5.7 (350 CID) V8, Road and Track Magazine tested one back in 1982 and obtained a 16.1 second quarter mile time along with a 0-60 mph time of 7.9 seconds. Car and Driver magazine (in the August 1982 issue) obtained a 0-60 mph time of 8.1 seconds and quarter mile time of 16.2 seconds for the 1982 Mustang GT. In the same test a 1982 Z28 (5.0 Cross-Fire Injection) obtained a 0-60 mph time of 8.4 seconds and a quarter mile time of 16.4 seconds. Worth noting Motor Trend magazine (September 1981) tested a pre-production 1982 Mustang GT and obtained a phenomal 0-60 mph time of 6.9 seconds and a (more on par with other magazine tests) quarter mile time of 16.1 seconds. Even so, American performance cars back in 1982 generally went 0-60 mph in 8-9 second range and for the quarter mile the range was 16-17 seconds. This was fast for this time period when most cars took over 10 seconds to go from 0-60 mph and well over 17 seconds to do the quarter mile. For 1983 and 1984 horsepower went up slightly. By 1984 the Camaro Z28 and Trans Am had as their top motor, the (L69) 5.0 H.O. 4bbl V8 (introduced in mid-1983) rated at 190 horsepower. The 1983-1984 Mustang GT also saw a nice bump to 175 horsepower for its 5.0 liter H.O. V8. The 1984 Corvette was also up, moving to 205 horsepower (5.7 liter Cross-Fire V8), however this new C4 (4th generation) Corvette performed a lot better than the 5 horsepower change would have you believe with a quarter mile time of 15.1 seconds and 0-60 mph in around 6.7 seconds. The improved aerodynamics of the 1984 (C4) Corvette verses the 1982 (C3) Corvette certainly helped in this performance achievement (there was no production 1983 Corvette). For performance fans the uptick in horsepower by 1984 was a welcome change. However the Corvette and Trans Am both received horsepower bumps in the late-1970s only to have horsepower slide back down a few years later. So the increases obtained for 1983 and 1984, it was feared at the time, may only be short lived. Then 1985 arrived and new apex would be reached one which would mark the return of true high-performance for multiple American performance cars, a phenomenon not seen since the early 1970s. First the Corvette would get an uptick of 25 horsepower which would give the Corvette its highest horsepower rating in eleven years. The change was due to the replacement of Cross-Fire Injection with a new type of fuel injection – Tuned-Port Injection (TPI) which on the same spec 5.7 liter V8 gave the Corvette a total of 230 horsepower. As expected with the new TPI motor the 1985 Corvettes 0-60 mph and quarter mile times decreased to 5.7 seconds and 14.1 seconds respectfully. And it marked the first time in eleven years that the Corvette broke into the 14 second range for the quarter mile. Last Corvette to do this feat was the 275 horsepower 454 CID V8 equipped 1974 Corvette. The GM F-bodies also broke into some serious performance territory for 1985; the Trans Am, Camaro Iroc-Z (a new for 1985 top-of-the-line performance Camaro), and Camaro Z28 – all received a hot new high-performance 5.0 liter TPI V8. The Iroc-Z and Z28’s 5.0 liter TPI V8 was rated at a very healthy 215 horsepower – good for 0-60 mph in 6.9 seconds and the quarter mile in 15.0 seconds. It marked the first time since 1974 that a Camaro produced over 200 horsepower. The 1985 Trans Am with its 5.0 liter TPI V8 had similar performance however it was rated at 205 horsepower. 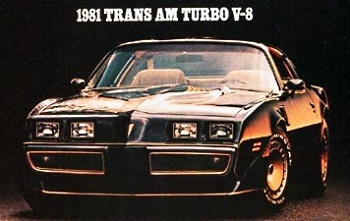 The 10 horsepower deficit was due to the Trans Am’s more restrictive airbox design. The Camaro had a nice wide opening in its front-end (gave the airbox nice flow of cool air) while the Trans Am’s beak was closed for improved aerodynamics hampering airflow when compared to the TPI equipped Iroc-Z and Z28. GM was also enjoying resurgence among its performance rear-wheel drive two-door G-bodies by 1985; the Oldsmobile 442, Buick Grand National, and Chevrolet Monte Carlo SS were modern versions of the vintage two-door GM A-body muscle cars (Pontiac GTO, Oldsmobile 442, Buick GS, and Cheverolet Chevelle SS). These cars had the long hood short deck lid design theme of the old muscle cars with a modern flair. Unlike most performance cars at the time like the GM F-bodies, Corvette, and Mustang GT; the G-bodies could fit five adults comfortably and had a large trunk capacity. In other words the performance G-bodies were family friendly. The 1985 Olds 442 was a modern rendition of Oldsmobile’s most famous muscle car bearing the same name. The familiar graphics and general look were there. The 180 horsepower 5.0 liter (Olds 307 CID) 4bbl V8, was not too shabby giving the 442 a 0-60 mph time of 9.1 seconds and a 16.6 second quarter mile time. The 1985 Monte Carlo SS used the 180 horsepower L69 5.0 liter (305) 4bbl H.O. which oddly enough was rated 10 horsepower less than the L69 equipped 1983-1986 F-bodies. The L69 powered Monte Carlo SS went 0-60 mph in 7.8 seconds and the quarter mile in 15.9 seconds. The real surprise among the performance G-bodies was the 1985 Grand National, under the hood was not the traditional V8 but a petite Sequential Port Injected turbo 3.8 liter (pushrod) V6. Buick by the late-1970s had put all its performance eggs in the turbo 3.8 liter V6 basket. It was a bold move however with the 200 horsepower 1985 Grand National hitting 0-60 mph in 7.5 seconds and obtaining a quarter mile time of 15.7 seconds it was quite apparent that this bold move had payed off. By 1986 the Grand National received an intercooler and horsepower went way up and performance also greatly increased pushing the Grand National into permanent legendary status. Unfortunately, the GM performance G-bodies’ success was short lived by 1989 they were all gone when the rear-wheel drive G-body platform was laid to rest. In 1985 Pontiac did not have a performance G-body, its G-body – the Grand Prix was relegated instead to sport luxury duty. However Pontiac had something even better – the new 1985 Fiero GT that came standard with a 140 horsepower 2.8 Multi-Port Fuel Injected V6 (also optional on the 1985 Fiero SE) which was a whopping 48 horsepower increase over the 2.5 liter Iron Duke four-cylinder powered Fiero. A 1985 Pontiac Fiero GT went 0-60 mph in around 8.0 seconds and quarter mile in about 16 seconds. Ford of course was not about to sit on the sidelines while GM’s performance cars were going horsepower crazy. The 1985 Mustang GT also had a big bump in horsepower jumping 35 horsepower to 210 horsepower. Behind the jump were some performance tweaks to the GT’s 5.0 liter H.O. V8 such as hotter heads and a new roller cam. The net result was a 6.4 second 0-60 mph time and a quarter mile time of 14.9 seconds. The Mercury Capri RS which shared the same platform as the Mustang and was Mercury’s performance car also received this new 210 horsepower motor and performed on par with its Mustang brother. This was not the whole picture, Ford had a hot new 205 horsepower 2.3 liter turbo four-cylinder powered 1985 SVO Mustang (a 30 horsepower bump from the 2.3 turbo in the 1984 SVO). It handled and braked better than the Mustang GT and its powerful turbo 2.3 put most performance cars to shame while sipping fuel compared to the performance V8 and V6 motors of this era. The 1985 SVO’s 0-60 mph time of 6.6 seconds and a quarter mile time of 15.1 seconds proved it meant serious business. Chrysler was dancing to the beat of its own drummer during this time. Gone were the high-performance V8s which were part of Mopar muscle car era mystique. The 5.2 liter (318 CID) V8 was all that remained for passenger car use, and that was a low compression 5.2 2bbl V8 powering the rear-wheel drive Chrysler Fifth Avenue. Instead the Chrysler Corporation was placing its performance mark with front-wheel drive performance cars powered by its 2.2 turbo four-cylinder. Two of the hottest cars in the 1985 Mopar lineup where the Omni GLH and the Shelby Charger (Carroll Shelby was working with Chrysler back in the 1980s giving them a high-performance helping hand). Both the Omni GLH and Shelby Charger had the hot 146 horsepower version of the 2.2 liter turbo. The 1985 OMNI GLH went 0-60 mph in 7.5 seconds and hit the quarter mile in 15.8 seconds which made for one very fast little car. The Shelby Charger had similar performance. Also worth noting there were a 1985 Dodge Daytona Turbo Z and Chrysler Laser, both were front-wheel drive cars that competed with GM’s F-bodies and Ford’s Mustang GT (and the Mercury Capri RS), and were equipped with Mopar’s hot 2.2 turbo rated at 146 horsepower. Certainly 1985 was a great year for American performance car fans, it was a year where horsepower soared and marked the final end of the horsepower low point of the mid-1970s to early-1980s. It would prove to be a lasting change with American performance cars which contined to climb the horsepower scale the next 25 years. Without the year “1985” – today there would not be a 425 horsepower 2010 Dodge Challenger SRT8, 540 horsepower 2010 Ford Shelby (Mustang) GT500 KR, 422 horsepower 2010 Chevrolet Camaro SS, or a 638 horsepower Chevrolet Corvette ZR1. Indeed 1985 was a fantastic year!